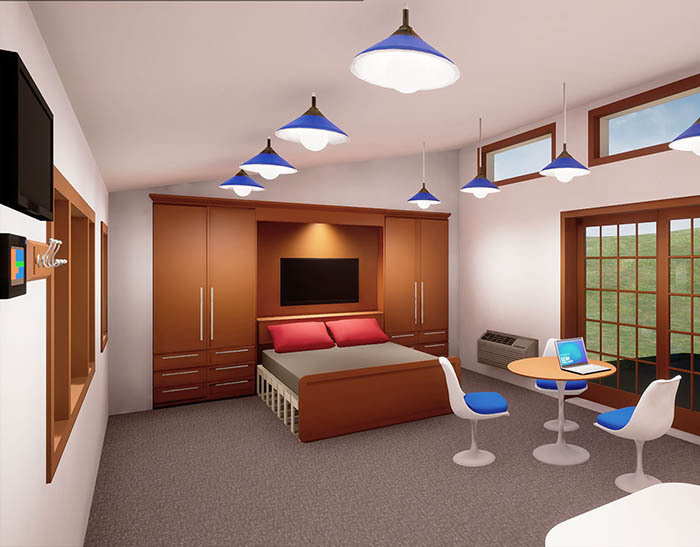 A rendering of the bedroom and dining areas of the tiny home shows ample storage and electronic comforts. Sitting in a conference room in the University of Nebraska at Omaha (UNO) Scott Technology Center, Bing Chen is surrounded by design renderings, a mobile robot and a protein bar. Chen, a professor of electrical and computer engineering, quipped about the house designs spread out on the table. Instead of waiting for retirement, Chen, and his friends in the renewable energy research field, is developing the area’s first sustainable small house. Chen is partnering with OPPD and other groups on the Small Sustainable House. Construction will begin this summer on UNO’s main campus. With so many baby boomers ready to enter their next phase, Chen said, good affordable housing is a growing need all over the country. The seeds of the idea came to Chen after visiting a close friend in a nursing home. “It was the only place he could afford,” Chen said. “His son doesn’t live around here, so he really isn’t able to help with his father’s care. I told my friend, ‘I’m getting you out of here.’ He was so depressed, he wasn’t speaking to anyone. 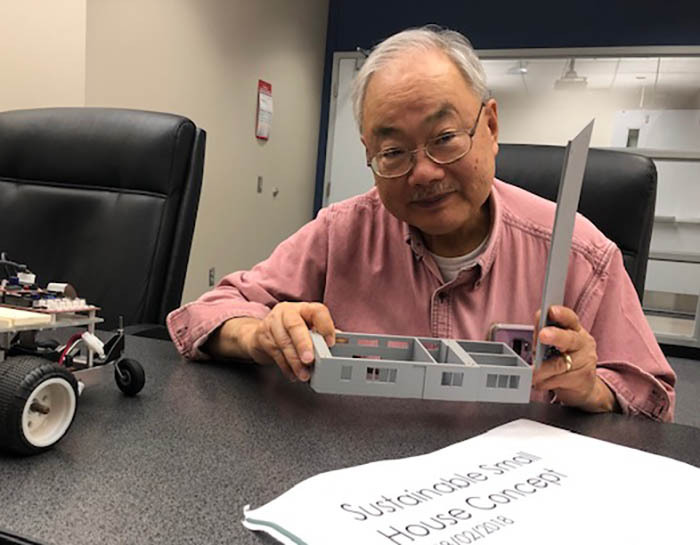 Chen has big hopes for the tiny homes he designed with Steve Eggerling, IT administrator at UNL. He noticed the popularity of ALUs (assisted living units) in places like Austin, San Jose, Calif., Seattle and Alexandria, Va. He thought adding solar and sustainable features could improve them. In essence, creating what Chen called a sustainable small house on “steroids.” The home will produce most of its own electricity, and collect most of its water while using a fraction of the energy for heating and cooling. Chen said the UNO prototype will be a smart home. It will be capable of adjusting temperature, lighting and other appliances automatically and by voice control. It will also monitor residents. If a loved one falls, owners can program the home to call their children and 911, if necessary. The exterior of the sustainable tiny home prototype. Other cities, including Lincoln, have ordinances that allow homeowners to place an ALU on an existing property if it will house aging parents. He thinks Omaha and other Nebraska communities will follow suit, especially if the Small Sustainable House project is successful. Chen said the home is well-insulated and can be heated with just 16 candles. The home will have 32 PV solar collectors on the roof to generate electricity and have a whole-house battery storage system. This will be the “Airstream” of ALUs, Chen said, referring to the iconic “silver bullet” aluminum campers. Chen worked with UNO’s gerontology faculty to design features to keep senior citizens safe, like rounded corners on counters, and to comply with the Americans with Disabilities Act. 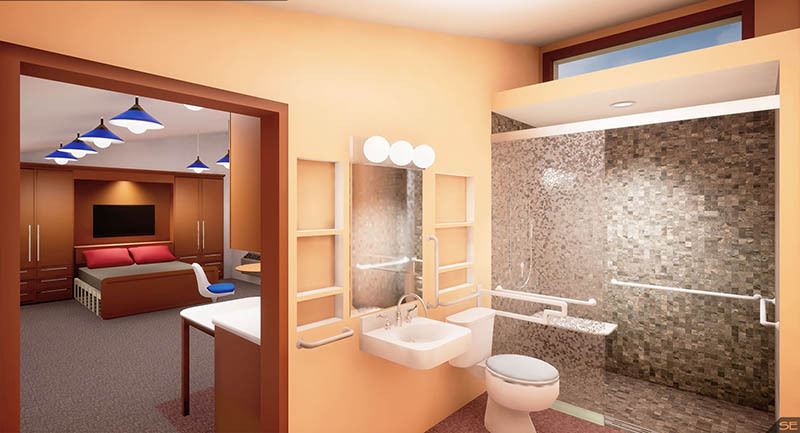 He also is working with colleagues and students to develop a system with a Hoyer lift on a ceiling-mounted track to help seniors move within the home. UNO will share research on the house with OPPD. This will allow OPPD to determine how new technologies within the home can be used on a wider scale. Battery-stored energy is one area of interest. The tiny homes provide all of the necessary comforts of home in an efficient space. Jim Helmberger, principal engineer in OPPD’s Planning & Strategy/Energy Delivery area, said OPPD could explore how batteries could provide emergency backup power, store surplus solar energy and might someday be able to help the utility meet peak demand needs. The batteries on the Small Sustainable House could provide energy when requested during peak times. They would recharge later during off-peak times. The batteries might someday be able to help the utility meet peak demand needs. Chen worked with a number of people from OPPD to explore how to best collaborate on the project. Another potential sponsor, the Nebraska Environmental Trust (NET) Fund could use test results from the UNO tiny home for other housing applications around the state. NET has preliminarily recommended funding for the project. 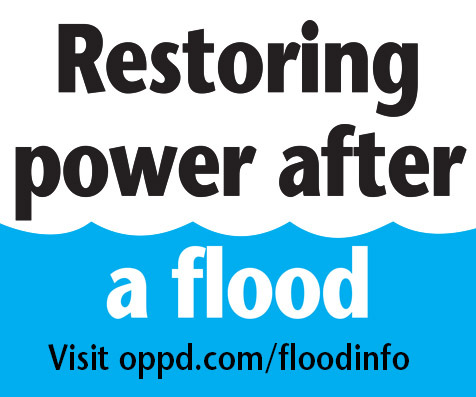 OPPD takes pride in community partnerships, especially those that provide education and solutions for our customers, said Laurie Zagurski, manager of Stakeholder & Community Outreach at the utility. Aside from being a preferred way for seniors to live out their golden years, it will also save them money. Chen said the price of the home would be far cheaper than several years spent in assisted living. Chen estimates the house will sell for $100,000. Since it is mobile, it can be resold while retaining its value. Please give me underground Gas and Electric Service as I am never getting on the roof to clean snow off Solar units.